I am a risk taker! Who would have thought! Well, it is not that I don't take risks in life. I did move to the other side of the globe for example. However when it comes to the things I make for myself, I don't seem to explore too many different styles and cuts. Well, not with my last project! The Patricia Rose dress pattern from Style Arc has such wonderful details! The horizontal tuck on the bodice, the inverted pleat on the front of the skirt, the V-neck, the pockets... What's the risk you ask? Due to the loose fit there was a potential of this dress looking like a sack on my frame. I knew the risk was big, but I just couldn't help myself. My hands were practically itching to make this dress! 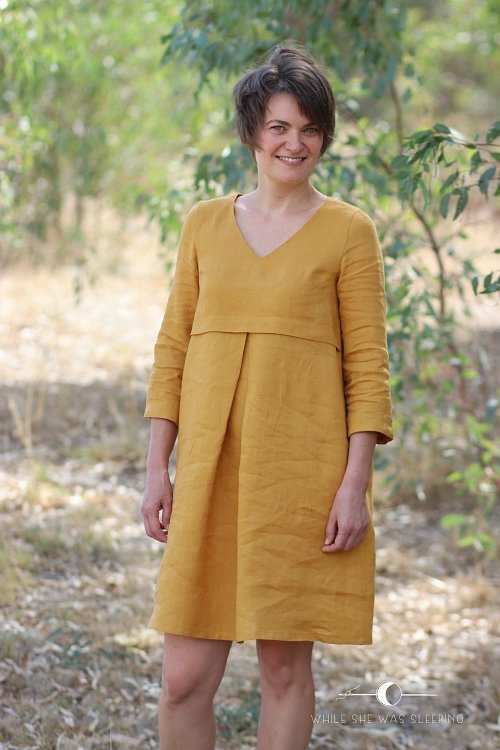 So when a few weeks ago Style Arc offered a number of their PDF patterns at half price and this dress was included, I bought it straight away. Sewing this dress wasn't too challenging. The instructions are brief, but clear. I decided to skip making a muslin since I already made a few Style Arc patterns. 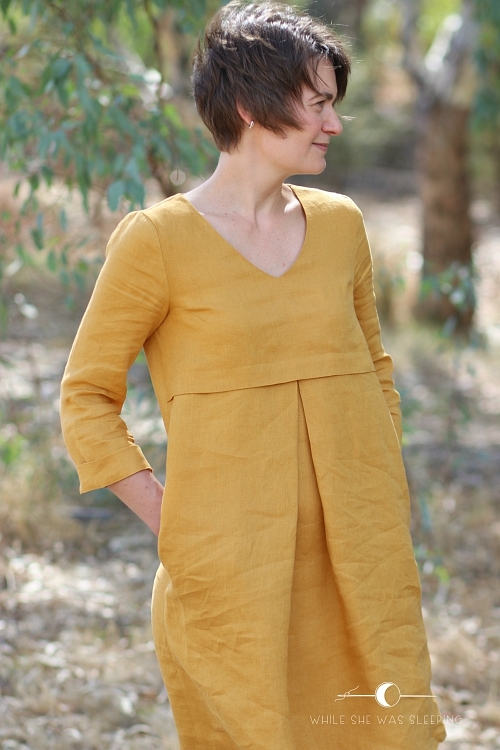 I new what size to make and didn't expect that a loose fit dress would require many adjustments, but I think I should have invested a little time into making a muslin. Ideally I would have liked my dress to be a little longer. Just a couple of cm would have made me feel a little more 'covered' on windy days. Something else happened as a result of sewing this dress... See how the caps of my sleeves look rather untidy? A rolled up towel is only good to a certain point before one comes to a realisation they need to invest into a tailor's ham. The difference proper tools make is simply amazing! I have already made my husband take photos of this dress twice, I did not want to push my luck asking for a third photoshoot now my sleeves looked decent. I would have given the dress a press before a repeat photo-shoot but my husband was in a hurry and I decided to just do it, as one well known company suggests. I thought that a solid colour would highlight the details of the pattern best. 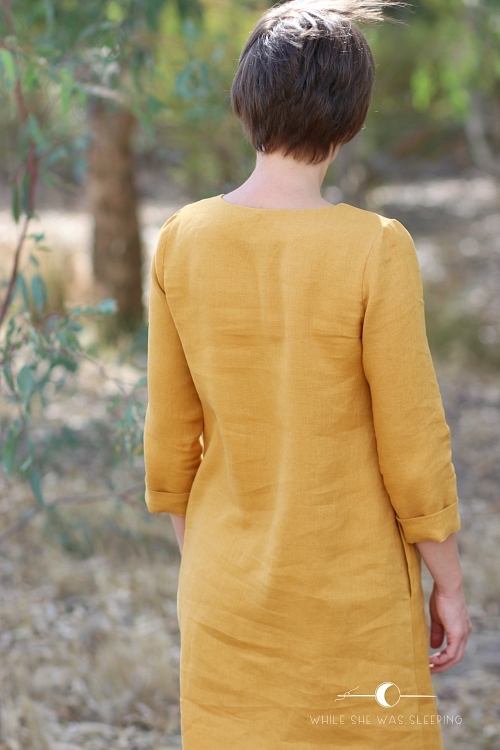 I used gorgeous linen in mustard from The Fabric Store. I have a little of this fabric left so I might shamelessly copy Anna! I am so glad I took the risk and made this dress. I think I need to wear it out and about a few times to make the final decision if this shape is 'my thing'. For now I feel very comfortable in this dress. I am even considering making another one, in a warmer fabric for when it gets colder! I like it a lot. The color is fantastic, and I don't think every dress or garment has to show off a figure. That said, the fit of the bodice through the shoulders and upper torso is very lovely, and I think saves the dress from being sack-like. As I mentioned on IG, I muslined this patteen a little while ago. My first attempt looked pretty bad but I'm itching to get back to it! Thank you Masha. Before I made the dress I was crossing my fingers and toes the bodice would do just that - offer a little shaping. There are small darts on the bodice too that I think definitely help. 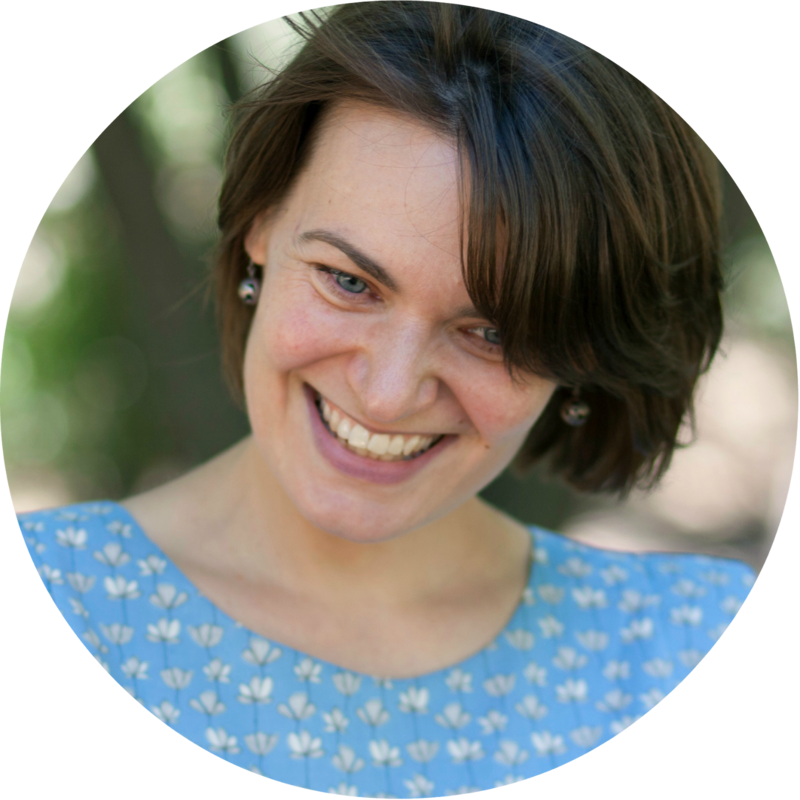 I am keen to hear how you are going to make this pattern 'yours' :) You always do! I think your dress looks fantastic. I love the colour and wish I could wear it but it's just not for me. 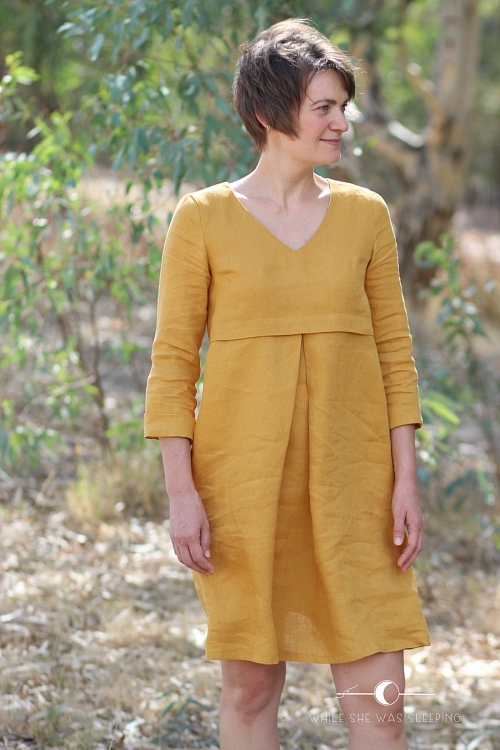 I made this pattern up a few weeks ago (during the heatwave) and love wearing it. 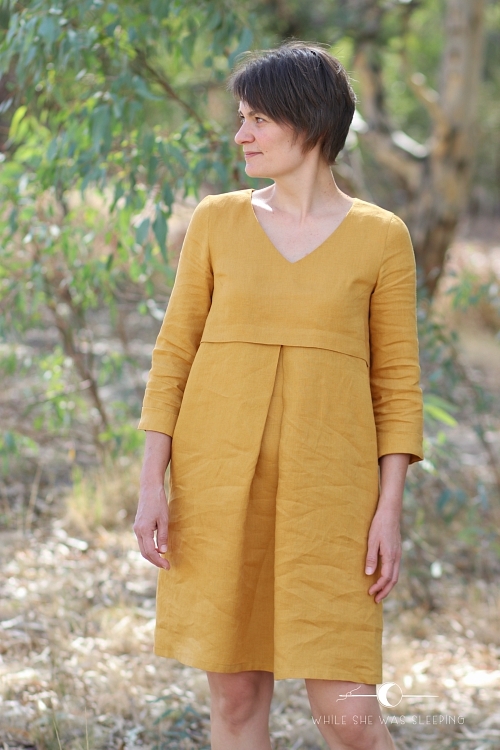 I made mine in cotton and it is so cool and comfortable in the hot weather - nothing clinging around the waist. I hope your enjoy your dress - I love mine and will be making another. Yes Nola, this dress would be so comfy on hot days! I tried it on a few times while sewing, and before I sewed the sleeves I thought I should make a sleeveless version next summer. I since saw a photo on a sleeveless Patricia Rose on IG and it looked great! I need this pattern. It‘s so beautiful on your slim frame. Do you think it would suit my curvy self? Thank you Bettina. I describe my body shape as a broom stick. Wide shoulders and then nothing really exciting anywhere hahaha I was seriously concerned the dress would not fit me at all as I just don't have the curves to make it look anything other than a sack. Surprisingly I don't feel like wearing a sack! Whoo hoo! I think it will look great on you! But then again, everything you make looks fantastic! Oh my,I love this dress. The pattern and the colour are just gorgeous. Makes me want to start sewing again. I think you have an unnecessary fear of sack dresses, lol. They look GOOD on you. And not like a sack at all btw. Beautiful! And before I cut anything, even a muslin, I stand in front of a mirror, holding up the paper patterns in front of me, and that gives a pretty good indication if length needs to be added. I pin my paper patterns together in SA if they are divided in e.g. bodice and skirt. Thank you Mie. I have embraced relaxed fit, time to embrace loose and oversized I think! And thank you for the tip! So obvious yet I didn't think about it! Oh no, now I want this pattern too! I love that pleat in the front! Hi Jenya, I am just about to make this dress myself. Just wondering about the sizing. Is it overly generous? I fall in between two sizes and can't decide whether to size up or down. 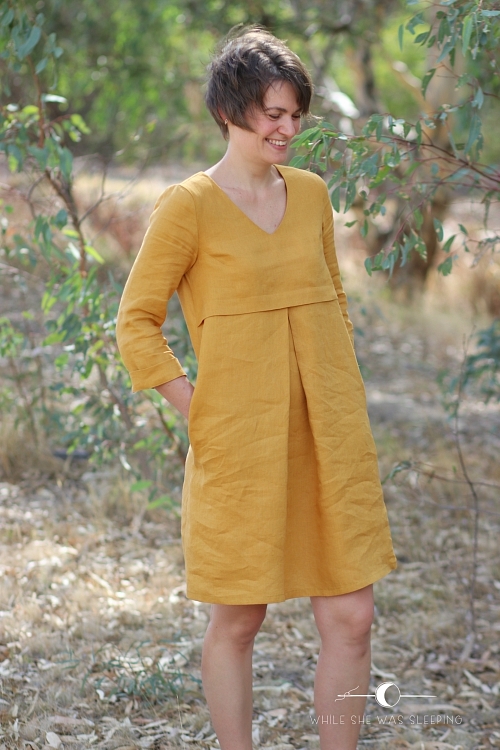 I am planning on making mine in linen also so I don't want it to swim on me if the pattern runs large. Sorry Julie I didn't see your question until now. I think the safest way to go would be to make a muslin. I think it is just roomy enough without being overwhelming, but that's on my frame!